Every year the TUC organise an awards event to honour the best work done by unions’ campaigners and comms teams over the past 12 months. 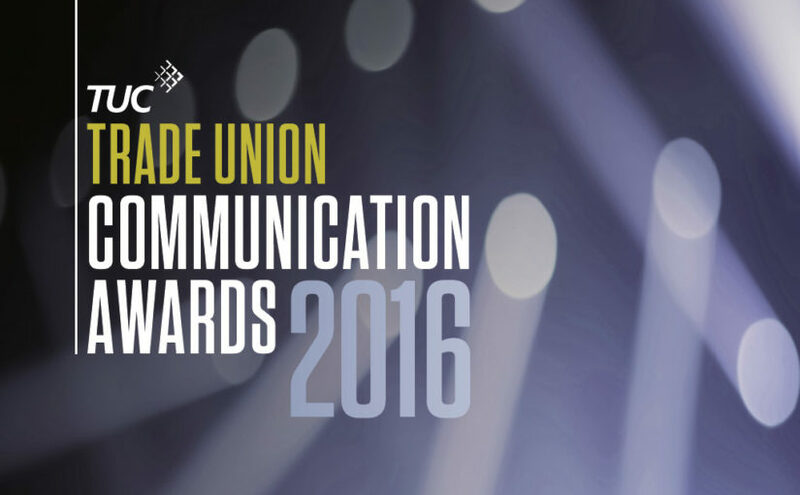 This year’s TUC Communications Awards was slightly different, as some of the digital-specific categories that we’d previously featured had disappeared, in favour of categories aligned more by function rather than by medium. It was a bit of an experiment for us, but we did it to show that union digital comms have now mainstreamed and should take equal prominence alongside other media. Digital projects could now be entered into any category (except the best member magazine one), and in many cases they took the prizes. Taking the Best Membership Communication award were UNISON, with their VOTR2015 app. This fun Tindr-style swipe app let members see how their political preferences matched other people’s, but also gathered insights that helped the union send much more personalised election communications through other channels, increasing engagement with their message. Unite’s successful campaign at Pizza Express scooped the Best Campaign Communications awards. Winning back the unfair credit card processing fees the employer was putting on their members’ hard-earned tips needed a lot of joined up organising, online and off, including an online petition and social media campaign, pressuring the company to drop the charges, even though the union are not yet recognised there. Digital projects winning the judges commendations included: BALPA’s 2WAY app, putting the union in members’ pockets anywhere, even in the air; UNISON’s Organising Space online community and toolkit for reps; Powerful videos from FDA and MU, introducing the unions to new members; and UNISON’s innovative Tax Credit Cuts campaign, which used Google maps to bring home the scale of the problem. Dropping the old digital-only category of Best Website wasn’t universally welcomed. We can see points on both sides here and we’ll evaluate what happens on this front later – let us know if you’ve any thoughts. Congratulations to all the entrants – there was a great standard of work again this year. We’re hoping to see digital projects do even better at next year’s awards!